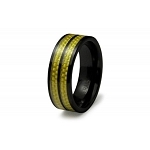 Men's tastes aren’t created equal, and JustMensRings.com believes that their accessories should be as unique as they are. Our 9mm men’s titanium black cable ring with a satin finish and 18k gold screws will allow you to leave a lasting impression no matter where life’s adventures lead. This ruggedly masculine ring features a slightly domed face as well as two grooves that expose black cables beneath for a bit of mystery. We upped the ante by adding 18k gold screws to create a two-toned effect that will win you some major style points anywhere you go. 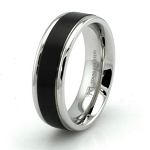 Each men’s titanium black cable ring with a satin finish and 18k gold screws is designed in the traditional style, which is comfortable to wear and will never fade from fashion. We also offer a wide range of sizes for you to choose from! 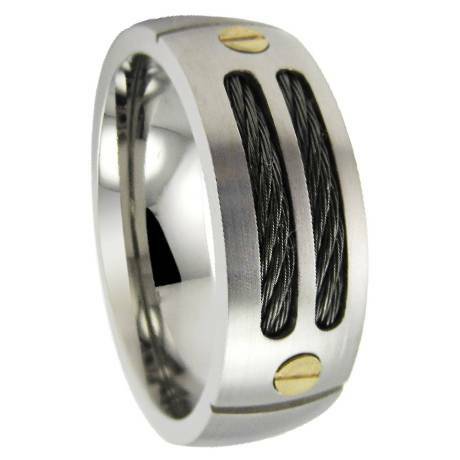 If you are new to the wild world of men’s jewelry, our 9mm men’s titanium black cable ring with a satin finish and 18k gold screws is a great example of what accessorizing can be. The striking satin finish strays far from any traditional polish that may look too shiny to wear to the office, and the exposed black cables add a bit of bad-boy edge that is guaranteed to demand double takes. Titanium boasts superior resistance to corrosion, denting, discoloration, and scratching. We recommend that you have your finger sized for accuracy by a professional jeweler to ensure that a traditional fit is right for you and your lifestyle. 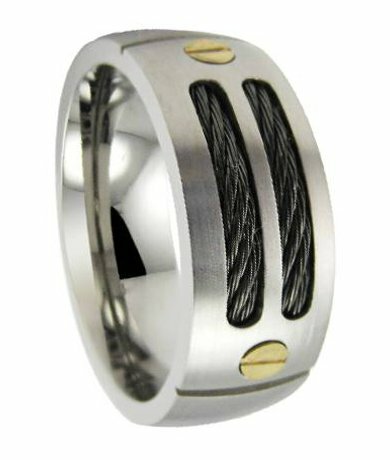 If you have any questions about the men’s titanium black cable ring with a satin finish and 18k gold screws, please contact us today to speak with one of our friendly representatives. This ring replaces the same style ring that I recently lost. I love the way it feels on my finger. The symmetry of the gold screws and the grooves on either side give it a balance that relate to how I see the world. I love it. brilliant ring, looks even better than shown. I gave this ring to my husband for our 16th wedding anniversary. The reason I chose this particular ring was for what it symbolized. I had both my hips replace with Titanium which not only allowed me to walk again but the cost sent us into huge financial strain which we endured as a couple. The gold screws were symbolic of my artist signature and the black cable symbolized our woven lifeline together. I had searched for a ring that really meant something to our relationship and when my husband received it he was moved by the irony of all the symbolism. Great item for what it represented. Isn,t that more important than cost and bling? this ring has been a huge hit. everyone loves it!